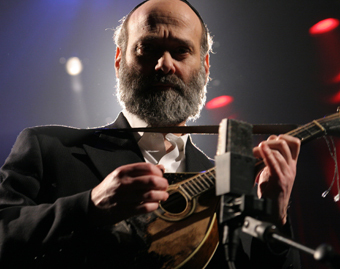 A master of both mandolin and clarinet, Andy Statman plays his own brand of bluegrass, klezmer, and jazz—playful, prayerful, and powerful in a way that you have to hear. The Chicago Tribune calls him “one of the greatest mandolinists of this—or any—era,” and Ricky Skaggs calls him “Bill Monroe and John Coltrane poured into one person.” He’s played with Bob Dylan and Itzhak Perlman, and released more than 30 albums, including his latest, Old Brooklyn, recorded with his trio, Jim Whitney on bass and Larry Eagle on percussion, as well as Byron Berline, Béla Fleck, Paul Shaffer, and John Goodman. At 15 Andy began studying mandolin in Greenwich Village with David Grisman, who became a lifelong friend and collaborator. David says, “If the only thing I ever did was give Andy his first mandolin lesson, it would have been a life well spent.” Andy worked as a studio musician, playing with David Bromberg, Vassar Clements, and Jerry Garcia, and went on to study saxophone with Earth Opera’s Richard Grando and clarinet with David Tarras, who led him to klezmer music. The National Endowment for the Arts awarded him a National Heritage Fellowship, the nation’s highest honor in folk and traditional arts. The Andy Statman Trio plays music like you’ve heard before, but different in ways that will make you swoon. Don’t miss this chance to catch them at the Freight.